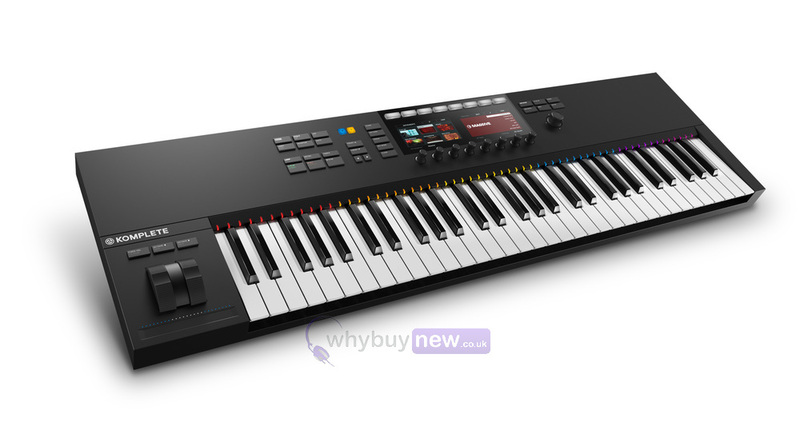 The Native Instruments Komplete Kontrol S61 MK2 is a keyboard controller that comes bundled with Komplete 12 Select, the intro version of the power Komplete music production software from Native Instruments. The Komplete Kontrol S61 MK2 is USB powered so there's no need to bring a separate power supply as it can be powered from your laptop, it also has a MIDI input and output along with 2 assignable pedal inputs! With KOMPLETE KONTROL, music-making becomes a more intuitive, hands-on experience. Perform expressively, browse and preview sounds, tweak parameters, sketch your ideas, then navigate and mix your project - all from one fully integrated centerpiece for studio and stage. MASSIVE - Heavyweight synthesizer combining analog architecture with wavetable synthesis. Perfect for heavy basses and piercing leads. MONARK - Uncompromising software version of the holy grail of analog monosynths. Every nuance has been meticulously studied to recreate the spirit of this legend in definitive detail. THE GENTLEMAN - Classic piano that delivers balanced tone, a wide dynamic range, and a beautiful, lush sound. Your new standard vintage upright. DRUMLAB - First-of-its-kind drum laboratory. Combine 38 pristinely sampled acoustic drums with 80 synthetic layers for a punchy electronic edge all from one intuitive interface. PHASIS - PHASIS combines timeless phasing effects adding movement, soul, and creative magic to any signal with powerful new features for never-heard-before results. REAKTOR PRISM - Unique and highly responsive polyphonic modal synthesizer capable of everything from hard basses and shimmering leads to organic soundscapes, percussive keys, flutes, and bells. SCARBEE RICKENBACKER BASS - The punchy midrange and stunning power of a Rickenbacker® 4003 captured for the first time officially approved by Rickenbacker. SCARBEE MARK 1 - The sound of an iconic electric piano, beautifully sampled and perfectly preserved in all its brilliance. RETRO MACHINES MK2 - 16 legendary vintage instruments from the 70s and 80s, lovingly sampled and refined. Retro analog sound with all the benefits of modern software technology. VINTAGE ORGANS - No producers palette is complete without classic organ sounds. Based on high-quality recordings of 50s and 60s tonewheel and combo organs, VINTAGE ORGANS is full of charm and character. WEST AFRICA - Vibrant percussion and enchanting melodic instruments plus an intuitive pattern sequencer. Play djembe, dunun, bells, and more solo or as polyrhythmic ensembles. SOLID BUS COMP - Inspired by a legendary bus compressor from a famous British console. Delivers power and punch without sacrificing clarity. REPLIKA - Two studio-quality delays and a powerful diffusion algorithm in a sleek interface. KONTAKT + REAKTOR PLAYERS - KOMPLETE 12 SELECT includes REAKTOR 6 PLAYER and KONTAKT 6 PLAYER, plus the new KONTAKT 6 powered ETHEREAL EARTH Play Series instrument. 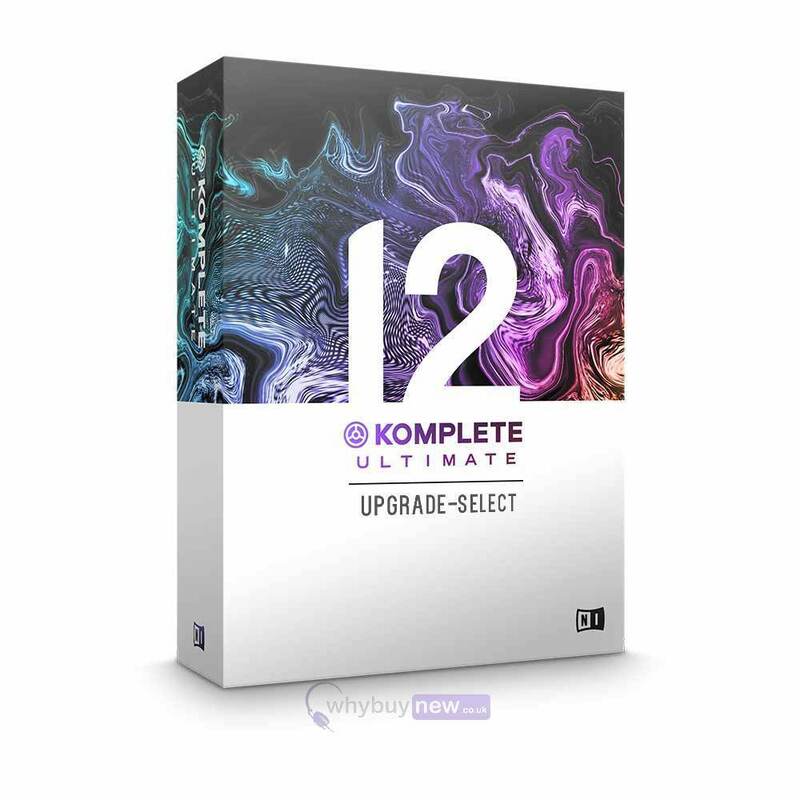 The Native Instruments Komplete 12 Ultimate Upgrade Komplete Select is the upgrade version for anyone who has Komplete 12 Select and wants to upgrade to Komplete 12 Ultimate. Please note that this will only work for existing users of Komplete 12 Select. Artist, producers, sound designers its time to expand your sonic horizons. Our biggest update ever supercharges your library with KONTAKT 6, THRILL, SESSION GUITARIST ELECTRIC SUNBURST, 20 Expansions, and a host of other new instruments and effects. So no matter your genre or production task, you'll always find exactly what you're looking for. Build just about anything you can imagine with KOMPLETE 12s two builder platforms. KONTAKT 6s advanced sampling and REAKTOR 6s flexible modular approach power thousands of innovative instruments and effects from NI, hundreds of leading manufacturers, and a growing community of users. Not ready to dive in at the deep end? Start making music straight away with comprehensive built-in libraries. 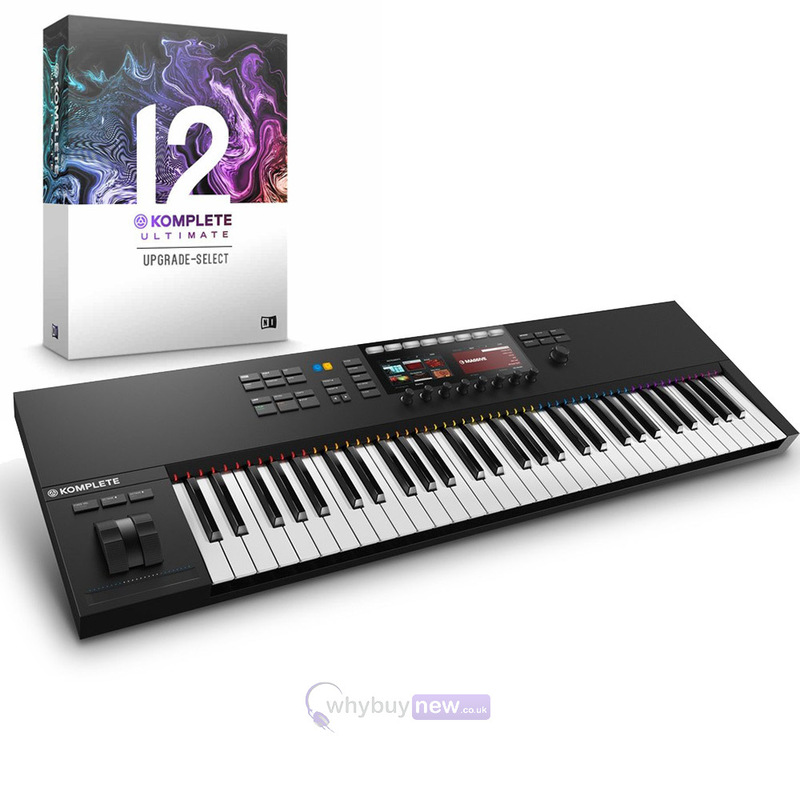 KOMPLETE 12 ULTIMATE contains an extensive set of sampled instruments for any scoring project, ranging from the rich orchestral libraries of SYMPHONY ESSENTIALS COLLECTION, to the movie-trailer ready sounds of ACTION STRINGS and ACTION STRIKES, and innovative sound design tools like THRILL, KINETIC TOYS, and KINETIC METAL. 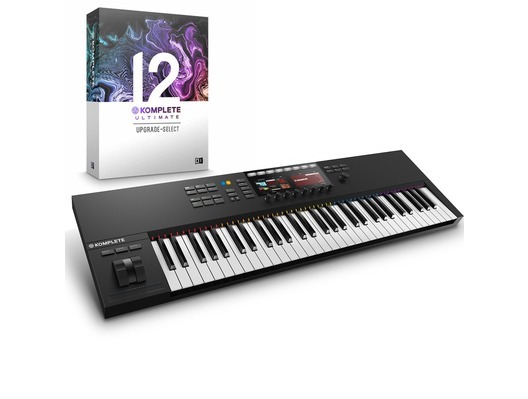 From faithful hardware recreations, to cutting-edge designs that go beyond the capabilities of even the most out-there analog gear, KOMPLETE 12 ULTIMATE boasts 16 expressive, versatile synthesizers. Dive into FM synthesis with FM8, discover new textures with FORM, or explore the uncharted sonic worlds of the forthcoming MASSIVE X. Unique to KOMPLETE 12 ULTIMATE are REAKTOR 6-powered favourites like FLESH, RAZOR, and SKANNER XT. KOMPLETE 12 ULTIMATE contains 30 sampled instruments, from unique pianos like UNA CORDA, THE GIANT, and ALICIAS KEYS to the pop-production sheen of SESSION STRINGS PRO 2, and the full DISCOVERY SERIES: COLLECTION. KOMPLETE 12 ULTIMATE includes dedicated percussion tools for everything from pop and rock grooves and boom-bap beats to movie-trailer impacts. Recreate the sounds of yesterday with the full suite of Abbey Road drums, design your own kits with POLYPLEX and BATTERY 4, or create dramatic wide-screen tension with DAMAGE. Sculpt, tweak, and tailor your sound with 28 studio-grade effect plug-ins from REPLIKA XTs infinitely tweakable delays to the retro-meets-futuristic EFFECTS SERIES MOD PACK and CRUSH PACK, and a full suite of mixing tools included in the SOLID MIX SERIES, VINTAGE COMPRESSORS, and more. You also get 53 additional effects and 17 amp sims courtesy of GUITAR RIG 5 PRO. KOMPLETE 12 ULTIMATE includes 20 Expansions genre-specific sound packs loaded with synth presets, drum kits, one-shots, samples, and loops. Created by top artists and sound designers, Expansions can be used in any DAW and work with a range of Native Instruments products, including MASSIVE, BATTERY 4, and MONARK. KOMPLETE 12 ULTIMATE may be bigger than ever, but getting up and running has never been quicker or easier. If you choose a physical copy of KOMPLETE 12 ULTIMATE, all of your instruments, effects, and additional content comes preloaded onto an HDD. Choose a download version, and your software becomes available right away via Native Access your one-stop hub for easy product installation, registration, and updates. Its not easy to make sense of over 45,000 sounds. That's why KOMPLETE 12 ULTIMATE comes with KOMPLETE KONTROL a handy plug-in that makes light work of browsing through all your instruments and effects, whether using NI hardware or your mouse and keyboard. And since each instrument preset comes with an audible preview, you can audition all your sounds without waiting for extra plug-ins to load. Everything in KOMPLETE 12 ULTIMATE comes ready-mapped to your NI hardware by the plug-in developers themselves, so getting hands-on with all your instruments and effects is as simple as connecting a KOMPLETE KONTROL keyboard or MASCHINE controller. And thanks to NKS, you get exactly the same experience with hundreds of plug-ins from more than 75 leading manufacturers. Dimensions: 1006 x 297 x 84 mm / 39.6 x 11.7 x 3.3"
Symphony Essentials - String Ensemble - The lush, detailed sound of a 60-piece string ensemble. Based on SYMPHONY SERIES STRING ENSEMBLE, with a reduced sample set. Symphony Essentials - Brass Solo - Solo orchestral brass recordings with pristine sound. Based on SYMPHONY SERIES BRASS SOLO, with a reduced sample set. Symphony Essentials - Brass Ensemble - Orchestral brass ensemble recordings with pristine sound. Based on SYMPHONY SERIES BRASS ENSEMBLE, with a reduced sample set. Symphony Essentials - Woodwind Solo - The sound of six professional woodwind soloists. Based on SYMPHONY SERIES WOODWIND SOLO, with a reduced sample set. Symphony Essentials - Woodwind Ensemble - The sound of a 36-piece woodwind orchestra. Based on SYMPHONY SERIES WOODWIND ENSEMBLE, with a reduced sample set. Symphony Essentials - Percussion - New in Komplete 12 - A versatile set of 55 orchestral percussion instruments, recorded at Studio 22, Budapest. Thrill - New in Komplete 12 - THRILL is a performance instrument for playing spine-chilling atmospheres, clusters, and hybrid textures in real time. Action Strings - The epic, orchestral sound of blockbuster movies, made simple via immaculately sampled and easily playable phrases. Action Strikes - A radically innovative instrument for huge cinematic percussion. Fast workflow delivers maximum impact and versatility. Evolve Mutations 2 - Two more GB of rhythmic suites, percussive kits, stings and transitions, and tonality and effects for the contemporary composer. Evolve Mutations - A 2 GB collection of rhythm and tonality instruments that provides a 'music-meets-sound-design' approach for the modern composer. Evolve - The premier cinematic sound resource with a definitive selection of extraordinary sounds, rhythms and FX. Rise & Hit - The ultimate suspense instrument for spine-chilling, cinematic build-ups with an exclusive set of sampled sounds. Emotive Strings - Soaring legato lines and brilliant arpeggios expressive, playable melodic string phrases in true-to-life realism. Kinetic Metal - An inspiring, highly-playable instrument of unconventional metallic sources for ethereal textures and tonal percussion. Kinetic Toys - New in Komplete 12 - A KONTAKT instrument fusing vintage childrens toy recordings with synthesized tones. For evocative leads, ethereal soundscapes, and more. Massive X - New in Komplete 12 - The next generation of the legendary synthesizer, featuring a breakthrough sound engine and a reconfigurable modular design available February 2019. at no extra cost. TRK-01 - New in Komplete 12 - A creative kick and bass instrument that marries innovative sound design, sequencing, and modulation, with classic mixing techniques. Reaktor 6 - The ultimate creative toolkit for deep sound exploration, featuring cutting-edge DSP and high-fidelity sound. Includes REAKTOR 6 BLOCKS. FM8 - The bright, lively sound of FM synthesis packed into a sleek user interface with innovative advanced features. Absynth 5 - Semi-modular, highly versatile synthesizer. Perfect for atmospheric pads, evolving soundscapes, and more. Form - Unique sample-based synthesizer with a refreshing approach to sound creation and an organic and powerful sound. Monark - Monophonic synthesizer capturing every sonic nuance of the king of analog monosynths in spectacular detail the holy grail of analog modeling. Rounds - A REAKTOR-based synth that combines digital and analog synth sounds with complex, sequenced sound-shifting capabilities. Massive - The heavyweight synthesizer for fat basses and piercing leads everything from creamy analog sounds to dirty, brute force audio. Reaktor 6 Blocks - Blocks combine the freedom and flexibility of modular patching with the trademark DSP quality of REAKTOR. Includes over 40 Blocks for limitless inspiration. Kontour - An innovative phase modulation synthesizer with expressive performance features that bring each note to life. Razor - An easy-to-use additive synthesizer with a detailed, dynamic sound, extreme sonic flexibility, and unique visual feedback. Flesh - The fun and innovative performance synth that turns anything you feed it into an electronic symphony. Skanner XT - A radical sampler and synth hybrid for creating raw and unpredictable sounds. Reaktor Prism - Unique, responsive polyphonic instrument and effect, based on the innovative modal synthesis technology from REAKTOR. Reaktor Spark - Stunningly dynamic synth sounds based on a unique REAKTOR ensemble developed by Native Instruments' founder Stephan Schmitt. Kontakt 6 - New in Komplete 12 - The latest version of the world's leading sampler, featuring an updated library of sounds and improved instrument-building tools. Session Guitarist Electric Sunburst - New in Komplete 12 - A beautifully-sampled, playable electric guitar, with 150+ patterns, riffs, and arpeggios, tailor-made for contemporary productions. Session Guitarist Strummed Acoustic - Your always-on-call session guitarist perfectly strummed and recorded patterns, vivid sound, and real-time performance control. Session Guitarist Stummed Acoustic 2 - New in Komplete 12 - The second edition in the SESSION GUITARIST series adds vintage 6- and 12- string guitars and an all new library of patterns. Una Corda - The special sound signature of a custom-made contemporary piano with one string per key sampled in intimate detail. The Grandeur - The rich, hyper-detailed sound of one of the worlds most treasured concert grand pianos. The Maverick - An expressive vintage grand piano, sampled in meticulous detail for authentic tone and distinctive character. The Giant - The world's biggest upright piano meticulously sampled for an intense, dynamic playing experience and cinematic sound design. The Gentleman - A classic upright piano that delivers balanced tone and a wide dynamic range, sampled from a vintage upright. Alicia's Keys - The sound of Alicia Keys' very own studio piano perfectly sampled from her playing with many authentic details. Retro Machines MK2 - 16 coveted analog synthesizers and keyboards, lovingly sampled from the original instruments for thick, creamy, analog sound. Vintage Organs - The sound of 5 classic organs: The Hammond B-3, C-3, M-3, Farfisa Compact, and Vox Continental II in one sample-based instrument. Discovery Series: Middle East - New in Komplete 12 - A playable collection of 25 distinctive percussion, melodic, and string instruments, drawn from Arabic, Turkish, and Persian traditions. Discovery Series: Balinese Gamelan - Experience the other-worldly charm of the Balinese Gamelan, perfectly sampled by Sonic couture. Discovery Series: West Africa - A collection of beautifully sampled percussion and melodic instruments from West Africa in a playable, polyrhythmic instrument. Discovery Series: India - A vast library of traditional Indian rhythmic patterns and historic scales, designed for ultimate realism and adaptability. Discover Series: Cuba - Authentic Afro-Cuban sound in a rich, highly-flexible instrument. Add evocative Cuban flair to your productions. Session Strings Pro 2 - New in Komplete 12 - A flexible 22-piece string ensemble with a modern sound and an extensive range of playing articulations for nuanced realism. Session Horns Pro - 10 instruments sampled in surgical detail, intuitively playable, and arranged for realistic, contemporary performance. George Duke Soul Treasures - 500 soul-drenched keyboard phrases, played by soul legend George Duke, and recorded with rare vintage gear. Scarbee Mark 1 - The sound of an iconic 70s electric piano beautifully sampled and perfectly preserved in all its analog brilliance. Scarbee A-200 - A classic and highly versatile electric piano sampled to perfection with its entire dynamic range and character intact. Scarvee Clavinet/Pianet - Two legendary keyboards expertly sampled and brimming with the unique character and funky feel of the originals. Scarbee Rickenbacker Bass - The punchy midrange and stunning power of a Rickenbacker 4003 captured for the first time officially approved by Rickenbacker. Scarbee MM-Bass - Classic 70s electric bass from Scarbee inspired by the sound of Bernard Edwards of Chic. Scarbee MM-Bass Amped - Classic 70s electric bass inspired by the sound of Bernard Edwards of Chic and recorded through four different amps. Scarbee Jay-Bass - Highly versatile, perfectly sampled slapped and finger-played bass from Scarbee. Features the sounds of a late 70s Jazz Bass. Scarbee Pre-Bass - Beautifully sampled Fender Precision Bass created by Scarbee. A vast set of playing techniques delivers true authenticity. Scarbee Pre-Bass Amped - Beautifully sampled Fender Precision Bass recorded through four different amps. Created by Scarbee. Scarbee Funk Guitarist - A detailed, playable instrument for authentic funk rhythm guitar. Play a wide range of licks and control their variations. Battery 4 - The 21st century drum sampler the worldwide studio choice for drum sampling and creative beat production. Damage - Playable instrument for breathtaking, epic cinematic percussion. Big drums plus edgy electronics, for modern soundtracks. Polyplex - An eight-part drum sampler with extraordinary randomizing capabilities, creative layering, and near infinite tweakability. Drumlab - A sonic laboratory for layering drums, combining pristine acoustic samples with a punchy electronic edge. Studio Drummer - Three premium drum kits, over 3,300 exclusive groove patterns and a detailed mix studio with high-end effects. Abbey Road | Modern Drummer - The powerful and versatile sound of contemporary rock/pop. Recorded at Abbey Road Studios, London. Abbey Road | 50s Drummer - The authentic sound of the very early years of popular music, recorded at Abbey Road Studios, London. Abbey Road | 60s Drummer - Exquisite vintage drums, with a typical tight, dry sound. Recorded at Abbey Road Studios, London. Abbey Road | 70s Drummer - Definitive 70s drums, from funky precision to bombastic heavy rock. Recorded at Abbey Road Studios, London. Abbey Road | 80s Drummer - Epic 80s drums from edgy new wave to big-budget metal. Recorded at Abbey Road Studios, London. Maschine Drum Selection - Groove creation tool featuring 20 drum kits taken from the MASCHINE library, an integrated drum computer, and effects. Guitar Rig 5 Pro - The ultimate all-in-one guitar and bass solution with 17 amps, 54 effects, and more. Easy to use, with breathtaking sound. Mod Pack - Phasis - New in Komplete 12 - Timeless phasing sound combined with powerful new features for never-heard-before results. Mod Pack - Choral - New in Komplete 12 - Classic chorus and more add width, movement, sheen, and shimmer to any signal, or take advantage of an all-new feedback mode. Mod Pack - Flair - New in Komplete 12 - FLAIR turns the classic flanger on its head, creating tuned harmonic flanging layers and resonances with a revolutionary new Voices mode. Crush Pack - Bite - New in Komplete 12 - Precision bit-crushing: Recreate the prized sonic imperfections that defined hip-hop and dance musics first golden era, or dial the bits right down to depth-charged extremes. Crush Pack - Freak - New in Komplete 12 - Three sound-bending modulation types offer retro radio lo-fi and wild sidechain ability, alongside classic AM, ring mod, and frequency shifting techniques. Crush Pack - Dirt - New in Komplete 12 - Organic-sounding distortion with flexible signal routing, blending, and a level of control not normally associated with distortion units. The Finger - An innovative multi-effects unit which can be played like a musical instrument. Derived from the live setup of Tim Exile. The Mouth - A unique synthesizer that generates melodies and harmonies from any audio input. Derived from the live setup of Tim Exile. Molekular - The modular effects system for REAKTOR inspiring effects, limitless routing, and electrifying performance possibilities. Rammfire - Ground-breaking amp emulation based on Rammstein guitarist Richard Z. Kruspes personal setup. Solid EQ - A versatile, 6-band equalizer with switchable characteristics. May well become your new favorite EQ plugin. Solid Bus Comp - More than a bus compressor. Use it on single channels, subgroups, or the master channel for consistently rewarding results. Solid Dynamics - Stereo compressor with gate and expander. A responsive, clean-sounding, works-on-anything effect for processing dynamic range. VC 160 - A classic compressor for added attack and subtle drive. Especially good for kick drums, snares, bass, or guitars. VC 2A - A smooth electro-optical compressor with a silky, natural sound. Great on vocals, bass, pads and guitars. VC 76 - A workhorse FET compressor with a fast attack. Great presence, punchy, clear high end. Good for drums, vocals, or stereo limiting. Vari Comp - An all-purpose, easy-to-use, two-channel compressor with breathtakingly transparent sound. For tracks, groups, and mixes. Enhanced EQ - A unique and easy-to-use EQ that fattens and enhances the low end, and adds definition and clarity on the midrange. Passive EQ - The rich, natural sound of a high-end, tube-powered studio EQ. Its musical character fits a wide range of production needs. RC 24 - Lush, larger-than-life hall reverb with impressive sound design possibilities. A classic reverb captured with stunning accuracy. RC 48 - The rich, elaborate, and refined sound of the king of hall reverbs that adds a golden touch to acoustic instruments and vocals. Supercharger GT - The sound of modern tube compression taken even further with superior control, additional saturation, and sonic sculpting. Replika XT - A creative multi-mode delay. With five vivid delay modes and advanced options, this effect delivers pure inspiration. Driver - A versatile, creative distortion and filter effect. Take tracks from subtle filtering to all out mayhem. Transient Master - An essential dynamics effect that enhances attack on drums and percussion, controls mix presence, and fixes problem recordings. Traktor's 12 - 12 studio-ready TRAKTOR effects for use with the free GUITAR RIG 5 PLAYER or GUITAR RIG 5 PRO. Reflektor - Convolution reverb based on Zero Latency technology. Over 300 impulse responses deliver a range of creative reverb effects. True School - New in Komplete 12 - Old school + new school = TRUE SCHOOL, perfect for futuristic beatmaking. Velvet Lounge - New in Komplete 12 - V.I.P. access to the sultry melodies, liquid atmospheres and forward-thinking rhythms of future soul. Deep Matter - New in Komplete 12 - Moody bass tones, melancholic pads, atmospheric field recordings, and crisp percussion to give you the beautiful darkness of Berlins ethereal techno. Halcyon Sky - New in Komplete 12 - The introspective, reverb-drenched sound of contemporary ambient electronica. Lucid Mission - New in Komplete 12 - The hyper-real sound of trance-infused EDM. An intense selection of synths, build ups, and steady beats. Neon Drive - New in Komplete 12 - The luminous sound of synth pop bursting with unforgettable melody and future-retro style. Queensbridge Story - New in Komplete 12 - The eclectic sound of Mobb Deep producer Havoc the man behind the sound of Kanye West, 50 Cent, Notorious B.I.G., and more. Molten Veil - New in Komplete 12 - Dancefloor-ready sounds designed by tech-house master Umek. MOLTEN VEIL explodes with dense basslines, jarring hi-hats, and seismic kicks. Elastic Thump - New in Komplete 12 - A modern, melodic take on funk that brews the smoothness of R&B with the feel-good vibes of dance music and the bounce of classic beathead culture. London Grit - New in Komplete 12 - Explore the UK underground grime scene with bone-crushing bass, icy FX, and drum kits by top artists. Drop Squad - The sound of dubstep, with punchy drums, wobbles, synths and deep basses. Platinum Bounce - The sound of hits fat beats for radio and clubs. Hard-hitting hip hop, dirty south beats, R&B, and crossover club anthems. Lazer Dice - The sound of the future bass phenomenon with deep rhythms and signature sound design. Marble Rims - Low-riding rhythms and funked-out flavor of West Coast urban attitude. Hop in and lay low for the ride. Caribbean Current - The rich tradition of Caribbean music culture as the foundation for modern club-ready rhythms. Astral Flutter - Sliced, chopped, rearranged samples for experimental hip hop from a new realm of consciousness. Cavern Floor - Descend into the depths of towering, modern techno with giant kicks, piercing hats, and sharp synths and melodies. Golden Kingdom - Throw open the gates to the hip hop dynasty stadium-sized music with dirt and grit that taps the new rap royalty. Byte Riot - Crunchy circuit-bent drum kits, warm 8-bit leads, and retro video game samples, for the lo-fi aesthetic of the Chiptune scene. Decoded Forms - Deconstructed breaks, evolving pads, disruptive bass, and crisp drums to give you the rhythmic kaleidoscope of post-jungle.